New York City (Manhattan) can be accessed from New Jersey by several modes of transportation including trains, subway, ferry, shuttles and bus. Coming to New York City (Manhattan) from New Jersey is inevitable by car. This website is dedicated to helping you find the right transportation and hotel accommodations to get from New Jersey to NYC. Answer: Chat with a local NYC expert. Katie is a NYC expert that can help you find out where to park the car outside of NYC, and where to stay in NYC. Chat now. Q: What are the Best Ways to Access NYC from NJ? Answer: Most people will turn to either the PATH Subway system, or NY Waterway Ferry fleet in order to get from NJ to NYC (Manhattan). Either options has parking garages nearby so if you are planning on spending the night in Manhattan you can park nearby the station and commute into Manhattan. Pro Top! Most people reserve a parking space aheadof time in order to make sure it is available. Park NJ Go to NYC Use the PATH Subway and or Ferry. Make sure to prepay and reserve a spot. Newark Airport to NYC Use this shuttle provider, it takes less time and is usually only $9 more dollars. NJ Hotel, Commute to NYC Use these exclusive maps and tables to find best hotels near transit to NYC. NJ Hotel w/ Shuttle to NYC There are a handful of hotels that do this, read this page. Q: What are Some NJ Hotels Near Transit Options to NYC? Answer: There are options for all types of budgets and vacations. This website is dedicating to helping you find NJ hotel near transportation to NYC. Use this map and table to find every hotel in NJ within walking distance to public transportation to NYC. Q: Why Should I Use the PATH Subway to Get to NYC? Answer: Simply put the PATH is the cheapest, fastest and most available mode of transit between Manhattan and New Jersey. The PATH Subway connects Newark, Hoboken and Jersey City to Manhattan Midtown and the World Trade Center. Q: How Much Does It Cost to Ride the PATH? Answer: All rides are $2.75 one way. Q: How Often Does the PATH Subway Run? Answer: For most intents and purposes the PATH runs 24/7. The trains run frequently and very late into the night and start early in the morning, most people won’t have any issues with the PATH schedule. Q: Can I Use the MetroCard on a PATH Train? Answer: Yes, the MetroCard can be used on the PATH. Q: How Long Does It Take to Get from NJ to NYC on the PATH Train? Answer: No more than 25 minutes from the furthest stations and as little as 12 minute if you are traveling from Hoboken to Midtown. Q: Can I Park Near the PATH Train & Ride Into NYC? Answer: Yes, the Newark, Journal Square, Newport and Hoboken Stations all have parking garages nearby. It is best to book parking ahead of time in order ensure that you are able to get a spot at a nearby garage. We found that parking near the Journal Square station is the cheapest option. If you plan to drop the car off in the morning and return the next day in the evening parking may cost between $25 and $35 near the PATH subway. Q: Why Should I Use the Ferry to Get from NJ to NYC? 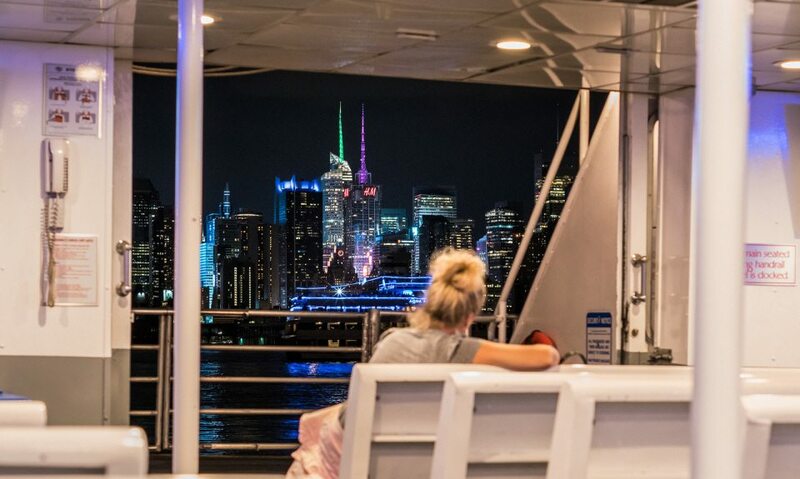 Answer: The NY Waterway Ferry is a good choice for two reasons; number one it provides an excellent view of the city while you are riding to and from NJ across the Hudson River. The second reason is that you can park your car for $16 / day at Imperial Ferry Landing Garage. This is generally one of the cheapest options for parking next to public transportation from NJ to NYC. Q: How Much Does the Ferry Cost from NJ to NYC? Answer: The Ferry cost $9 for adults and there are discounts for kids. Compared to the PATH subway system this is X3 as much. For some people the best option is to take the Ferry over in the morning to enjoy the city views and the PATH back at night (perhaps in the summer use the PATH in the morning and the Ferry at night). If you choose to split transit between the PATH and the ferry it is best to park near the Newport Ferry Landing / PATH Stations. Q: How Often Does the Ferry Run? Answer: Ferries typical run every 20 minutes, a good rule of thumb is to make sure you are ready to catch the Ferry at night no later than 11:30 if you are traveling back to NJ. While there are many ferry landings the most popular landing is the Port Imperial / Weehawken landing. Q: Can I Park & Take the Ferry from NJ to NYC? Answer: Yes. We suggest that people either use the Port Imperial / Weehawken landing parking garage, or park near the Newport PATH station. Parking near the Newport PATH station will be more expensive and it is best to reserve a spot ahead, but at the same time the PATH will be X3 cheaper to use. Therefore you could take the ferry in the morning and PATH at night to return home. The PATH also runs more frequently. Q: Why Should I Use NJ Transit Trains to Access NYC? Answer: NJ Transit trains are useful in a few different scenarios, most notably if you want to stay at a hotel in the NJ suburbs with free parking near a train to NYC. The trains are needed if you want to get from Newark Airport to NYC, and they are helpful if you are coming from Trenton. Beyond this the trains tend to run less frequently than the PATH and are more expensive by X3 – X5 times. Q: Can I Park Near a NJ Transit Train Station & Ride to NYC? Answer: Yes, but the options are limited and you should understand the trade offs. Often the deeper you go into the NJ suburbs the cheaper parking becomes, at the same train fares go up and so do the commute times. Take a look at the Montclair Heights station, here parking is $5 per day and the commute into the NYC is 45 minutes via the NJ Transit Trains. MetroPark is also another station within an hour commute of NYC on the train, here parking is $10 per day. Answer: There are three primary affordable ways to get from Newark Airport to Manhattan. Those are either via the NJ Transit train, bus or via a shuttle provider. Anticipate spending $50 or more to get a cab / Uber from Newark Airport to NYC. NJ Transit does not provide a quick and easy bus route from the airport to Manhattan you’ll have to make at least one transfer. Therefore, for the majority of people it comes down to the train or shuttle. Answer: A shuttle can be the most convenient option for some who doesn’t feel like managing public transportation. Anticipate spending about $21 to get a shuttle from Newark Airport to Manhattan. Research showed the best option to be GoAirLink NYC. They can drop you off at multiple places or your hotel from the airport. Answer: Getting from Newark airport to Manhattan via public transportation on the train requires two transfers and will cost about $12. Anticipate spending about an hour commuting. The first step is to catch the AirTrain from the terminal to the Newark Airport NJ Transit Terminal. Here take the NJ Transit Train to Newark’s Penn Station. Once you have done this transfer at to a train that goes to Penn Station in NYC. PRO TIP! There will be information desks at the Newark Airport that can help, so don’t fret too much about knowing how to do everything ahead of time. Answer: When you arrive at Newark airport go to a help desk and ask for information, this will make your life a lot easier. You’ll catch a bus to Newark’s Penn Station and there you will have to transfer to another bus that will drop you off at NYC’s Penn Station. Q: How Can I Get from NYC to Newark Airport? Answer:The most practical method is to use a shuttle service where the cost is about $21 per ride. We suggest GoAirLink NYC because they can pick you up from multiple locations and take you directly to the Newark Airport terminal. The other alternative is to use the NJ Transit system and the cost will be about $12 by train and about half as much by bus. The downside is you need to transfer trains twice, or transfer buses once. Q: How Can I Get from NYC to Newark Airport Via Train? Get to NYC Penn Station and take it to Newark Penn Station. At Newark’s Penn Station transfer trains and take a train to Newark International Airport Station. 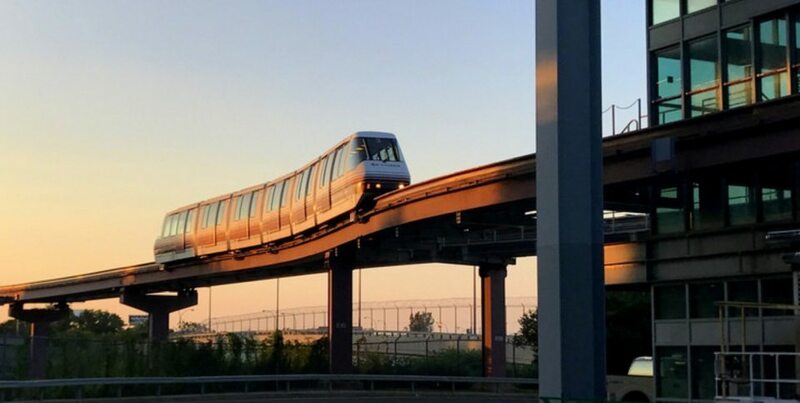 From Newark’s International Airport Station take the AirTrain. Q: How Can I Get from NYC to Newark Airport via bus? Answer: Get to NYC Penn Station and take a bus to Newark Penn Station, from there you will need to transfer to a bus that goes to Newark Airport. There are no direct express bus routes from NYC to Newark’s airport. Answer: The two ways to get from Newark, NJ to NYC (Manhattan). The cheapest and most efficient way is to use the PATH subway. The PATH subway will take you from Newark to Manhattan in about 30 minutes. The cost is $2.75. Trains also depart from Newark’s Penn Station and commute to NYC’s Penn Station, however the train is often more expensive and slower. 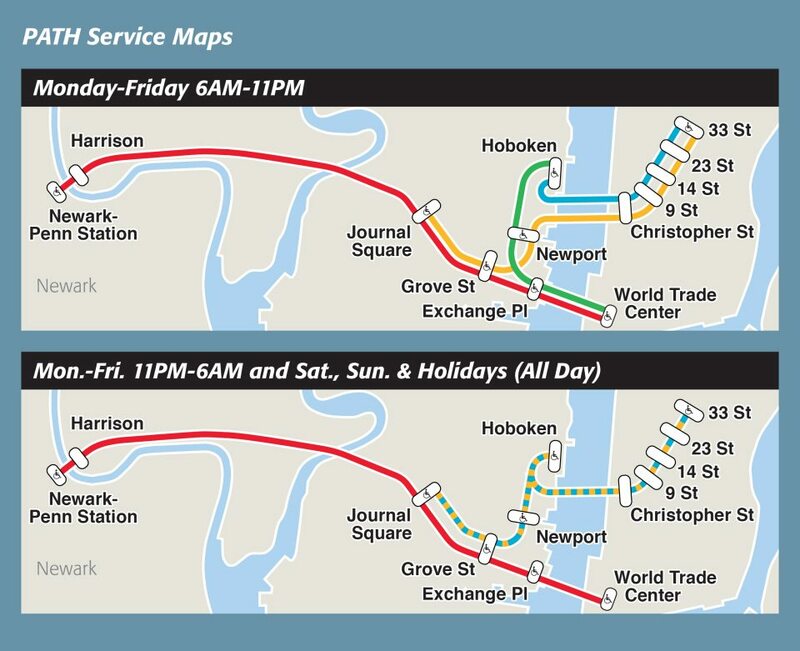 Answer: The two ways to get from Jersey City, NJ to NYC (Manhattan) are either the ferry or PATH subway. The PATH subway is going to be the most affordable and most practical method. Jersey City, is only a 20 minute commute from NYC. Answer: The NJ Transit trains are the best option for public transportation from Trenton NJ to NYC. The ride from Trenton to Penn Station in Manhattan will take about 1 hour, and the cost of the train fare is about $17 dollars. There are over 1,000 parking spots available next to the Trenton station at a daily rate of $18. 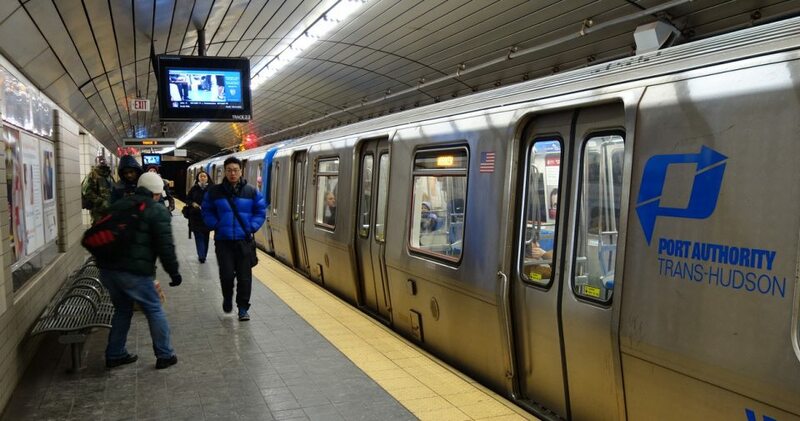 Answer: The most practical and popular way to get from Hoboken to NYC is to take the PATH subway which runs nearly 24/7. The PATH is $2.75 per ride and can drop you off as close as one block from the Empire State Building. It will take less than 20 minutes to get from Hoboken to NYC on the PATH. The other alternative is the Ferry which costs $9. Ferry hours are more limited, so if you plan on staying out late in NYC you may want to take the PATH back. Q: Can I Park in Hoboken, NJ Near the PATH of Ferry? Answer: There are no free on-street parking options in Hoboken, but you can park within a short walk of the PATH station or Ferry landing. Make sure to book your parking space ahead because spots will fill up quickly on popular weekends. Q: How Far is NJ to from NYC (Manhattan)? Answer: It only takes 10 minutes to get from NJ to NYC via Ferry or the PATH subway. New Jersey and NYC is separated by the Hudson River from NYC (Manhattan). The area with the most options for transit into NYC is Jersey City. Often its popular for people to buy parking in advance and park in Jersey City for a day trip to NYC. Q: How Do I Get a Bus from NJ to NYC? Answer: There are express bus routes from the either the Secaucus Junction bus station, or the Irvington bus station in New Jersey. A bus will take between 35 and 45 minutes to get into NYC. Typically most people will use the PATH subway over express bus routes to commute from New Jersey to NYC because it is cheaper and faster. Katie is a NYC expert that can help you find out where to park outside of NYC and commute into Manhattan (NYC) Chat now. Q: How Can I Get from NYC to NJ? We are a family run website. We have helped hundreds of thousands of people find a place to stay around NYC.